We offer patients that have been diagnosed with the life altering condition known as Obstructive Sleep Apnea , a way to possibly treat it without using a CPAP or in combination with a CPAP but at lower and more comfortable pressure. Oral appliances are comfortable and easy to wear. Most people find that it only takes a couple of weeks to become acclimated to wearing the appliance. 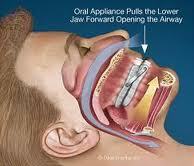 Oral appliances are small and convenient making them easy to carry when traveling. Make an appointment with us today to go over your options today. Dental treatments for the condition can include replacing missing teeth, moving teeth, adjusting the bite, filling gaps between teeth,fabricating night guards etc. There is no one solution that is right for all cases. Sometimes a plastic mouthpiece is used to prevent clenching or grinding that is contributing to the problem. If untreated and taken to extremes, surgery may be required to repair a badly damaged joint.